Fred has made several changes to file1.txt and file2.txt and committed them to the repository. In this section additional changes will be made and then synchronized with the repository. When synchronizing, expect to see the changes made in this section along with changes that have been made by Fred. Observe that the Project Explorer displays the CVS state of a resources. 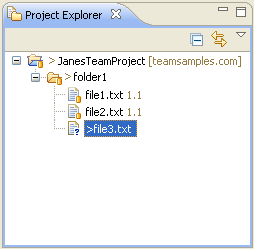 Notice that the new file added by Jane is preceded by ">". There are a couple of other things worth observing. First, the icon next to file1.txt (in the structured compare area) indicates that file1.txt has an incoming change. This means a change was released to the server which you need to take. Looking at file1.txt we can see the text that Fred has added to the file. Also, notice at the bottom of the window, in the status line, there are arrows with numbers beside them. These show the number of files you have incoming, outgoing, and in conflict. The first number beside a file is the revision you have in the workspace, and the other is the revision on the server when you last synchronized. Normally you should update the changes made by others, then test your workspace with the changes, then commit your changes once you are sure that the new changes by others didn't break anything in your workspace. Before deciding to accept Fred's changes you may want to find out why he made the changes. 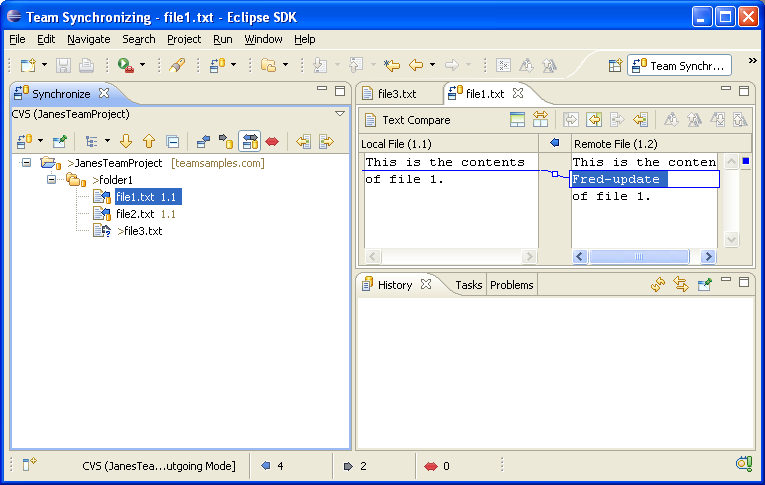 Select file1.txt and from the context menu select Show in History. The row starting with a * indicates that this is the current revision loaded. In this case you can see the comment made by Fred when he released revision 1.2. Tip: You can select the Link with Editor and Selection toolbar button in the History view to have the history automatically update when a new editor is opened or when the selection changes. This allows for quick browsing of comments. To update simply select JanesTeamProject in the Synchronize View and from the context menu select Update. The Synchronize View will update to reflect the fact that file1.txt and file2.txt are no longer out-of-sync with the repository. You should only have file3.txt visible now. Next you can commit file3.txt.